The second stop of the United States Pro Kart Series reached the 163-driver mark for each day this weekend, making it just six short of we saw wat the Mooresville event in April. 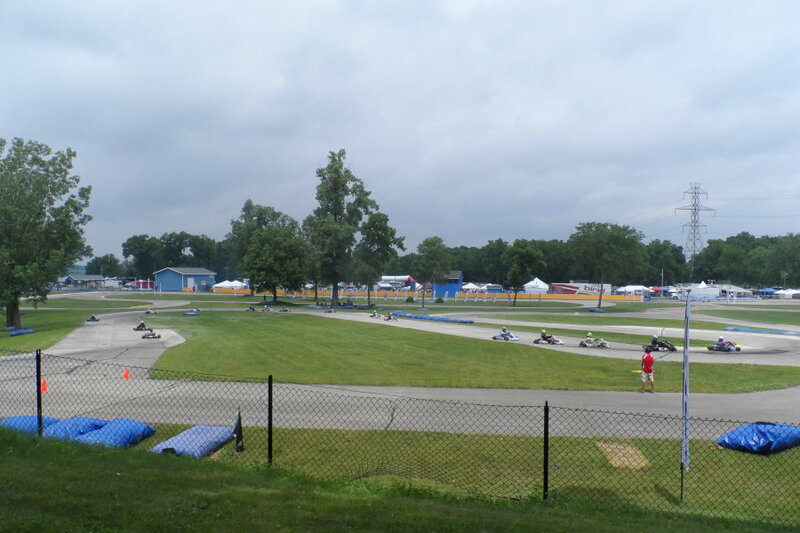 A number of Great Lakes regional drivers have made their way to the MRP circuit for their first race of the USPKS season, which had helped maintain the kart count. Trackside, the weather has crept in to play a factor early in the weekend, as both the temperatures and the humidity are significantly higher than North Carolina. Storms rolled through the area on Thursday evening and Friday morning, leaving the track a bit damp this morning. Practice continued on throughout the day, and weather remained threatening with weather systems rolling in off the south end of Lake Michigan. With 11 drivers under their tent, the Checkered Motorsports/PCR USA program is growing strong with the USPKS series and other events throughout the eastern half of the country. From Cadet to Junior, Senior to Masters, the operation is working with all levels of Arrive and Drive programs this weekend. Robby Bujdoso, a five-time WKA TaG champion is leading the tent, working with all the drivers and crew, while going one-on-one with Cadet driver John Paul Southern Jr. Bujdoso is focused on growing the PCR brand and the race team, while working to gain enough support and sponsorship to race in the ARCA series at Kentucky later this year. The PCR brand will be battling for podium finishes all weekend long. One of the bigger news items to be released going into the event was the announcement of California driver Andrick Zeen signing with Praga North America. The 22-year began racing under former national champion Phil Giebler roughly 10 years ago. 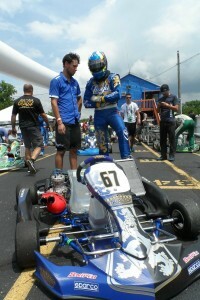 He became part of the G-Phactory program and raced in Europe for a few season with Sodi Kart factory team in France. Since, he’s worked around the country with different drivers and is now back behind the seat full time. Blake Wankowski – team manager and owner of Kart Star Motorsports – and former WKA champion Tommy Andersen are helping to turn the wrenches for Zeen. A former multi-time Cadet champion Sage Karam brought an exciting atmosphere to this year’s Indianapolis 500. After he and his team nearly won the Pit Stop Challenge with Karam pumping up the packed crowd with his enthusiasm, the 19-year old drove from 31st to ninth in the 500 lap event in his rookie campaign. Next weekend, he’s scheduled to compete at the Six Hours at the Glen with two previous sportscar races at the 24 Hours at Daytona and the Sebring 12 Hour. Karam is partnering up with the iKart factory team, the same chassis and operation that he helped to put on the pole position at the RoboPong 200 last October with Indy Lights driver Gabby Chaves. This weekend, nearly 30 people are here at the MRP facility with cameras, boom mics and other filming equipment to gain footage for an upcoming reality show. A TruTV show is collecting footage, focused on the sport and the family aspect that it presents to those looking for their motorsports fix. A number of GoPro cameras are set up, people with cameras and drivers/parents mic uped are giving the crew hours of footage during practice day, with plenty to come the following two days. The rain stayed clear for the remainder of the day, allowing a dry track to give the racers a feel for the rest of the weekend. 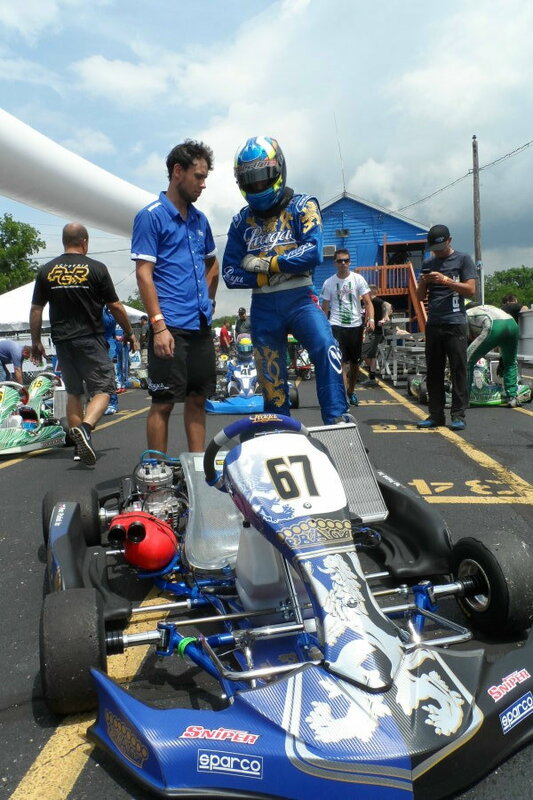 Longtime MRP racer Armin Cavkusic (Franklin Kart/FA Kart) topped the charts in the Leopard Pro category, with a top 13 within a half-second. Championship leader Brandon Jarsocrak (Mike Doty Racing/Haase) was quickest in the Yamaha Pro division. Laurentiu Mardan (Kosmic) set the fast time in the Parilla Challenge. Braden Eves (Tony Kart) and Brandon Lemke (Merlin) were fast drivers in the Leopard and Yamaha Junior divisions while Sam Mayer (Merlin) and Aidan Harrington (Birel) set the quick laps in Mini Rok and Yamaha Cadet. Indiana driver Aiden Lindley (Birel) was the fast time in the Yamaha Rookie class with four drivers within a tenth of each other.